A protein from green algae that will supposedly revolutionise brain research? Just a few years ago, that was still an absurd notion for most scientists. Green algae make use of a light-sensitive protein – channelrhodopsin – in order to align themselves according to the sunlight. Channelrhodopsins are ion channels, i.e. pores in the cell membranes, which allow positively or negatively charged ions into the cell. These channels open during radiation from light, and ions roam through the cell membrane, thus changing the electrical charge of the cell. The cell is either activated thereby and moves, or it is inhibited and becomes silent. With the so-called Parkinson Mouse – if the neurons responsible for movement are damaged, it will hardly move. Laser light can be sent into its head via fibre-optics. If the researchers switch on the light in the head, the nerve cells become activated once again and the mouse runs away. 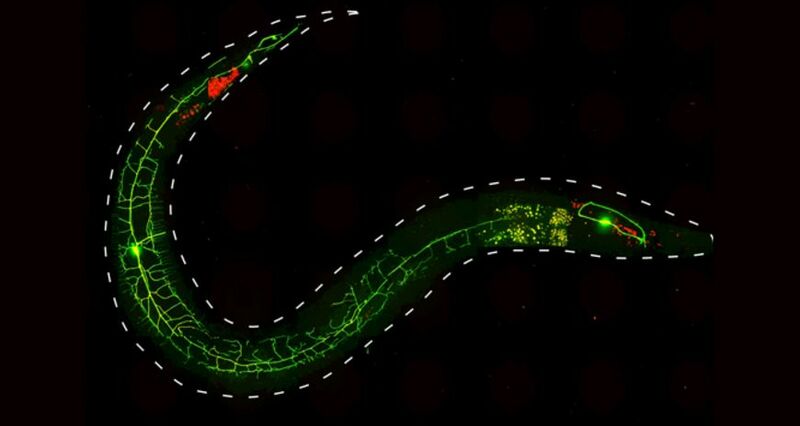 By means of a threadworm (nematode), in which several kinds of light switches are integrated into its movement neurons; it crawls forwards or backwards, relaxes or unrolls itself, depending on whether it is illuminated with blue, green or yellow light. Neuroscientists are not, however, interested only in movement systems – with the model animal mouse, they are investigating as well, by means of optogenetics, sleeping disorders, learning processes, addictive and/or eating behaviours. The researchers require for different experiments different respective channel proteins with special characteristics. A group of scientists from Humboldt University Berlin, the Karlsruhe Institute of Technology (KIT) and the Centre for Molecular Neurobiology Hamburg modified, for example, a previously-known channelrhodopsin. They changed the structure of the light-sensitive ion channel, in order to reverse its function – instead of positive ions, the channel now allows negative ions to pass through. The nerve cell is no longer stimulated by the light signal; rather, it is inhibited by it. Particularly from a medical point of view – the inhibition of brain activity is important. This is because diseases such as epilepsy or Tourette-syndrome are caused by precisely such over-stimulations in certain areas of the brain. And one more request on the part of the researchers fulfils the new channel variation – after a short light stimulus, the protein channel opens much longer than others and allows a surge of ions into the cell. In the application, the new channelrhodopsin then appears to be much more sensitive to light – for the control of a cell, it needs only one ten-thousand-part of the quantity of light required previously. A small stimulation with big results. In this manner, large regions of the brain can be addressed by means of very fine fibre optics or installed LED’s. With specific channelrhodopsins, no skull implant at all is required and it is sufficient to shave the mouse’s head and to illuminate from outside. In the mean time, around 1,500 laboratories worldwide are working with light-switch proteins. This typically involves basic research; in particular, the mode of operation of nerve-cell associations is what interests the scientists. Over the long-term, they are hoping for therapeutic possibilities for neurological diseases, such as epilepsy or Parkinson’s disease. Even earlier than that, experiments regarding re-activation of inflicted sensory cells in the human eye or ear should be initiated.